Signalman: Do you have an Opening for me ? Do you have an Opening for me ? Currently running in the chess blogosphere, is a variation of the eternal and probably unresolvable "Use of Opening Theory" discussion : Super-GMs vs the rest. Dennis Monokroussos and Dana Mackenzie, are debating the process/benefits/methods of opening theory ( or "Opening Theory" as they have now re-defined it) and particularly how non-Super-GMs, including Amateurs, should, or should not, use it in our chess games: self-discovery vs re-use of previous experience (in a nutshell) plus a few more complications. Happily, it seems much more of a discussion than a serious spat. Here's the original 2008 post and the recent response, both to keep you entertained, and thinking. I have to say I agree with parts of both arguments. My games rarely follow established opening lines for long, so, yes, I would probably be better off with sensible developing rules (does that mean 'classical' ? ) rather than slavishly trying to remember a variation in my opponent's chosen line or sideline. This should enable me to spend more time on what matters, ie playing a decent middlegame and spotting tactics and combinations ! Definitely, I should also look in more detail at the opening moves. Not necessarily to find novelties, or to derive my own opening moves, but more that I understand reasons behind the 'theory' moves, so can eventually begin to appreciate why "Opening Theory" is there, and how to use the benefits it brings ( ie how to hack into and re-use all the exploration and thought that previous players have bequeathed to us ). One area that I do think is useful ( and enjoyable ) is the re-discovery ( or re-use ) of old variations. Such lines, probably unplayable at GM level these days, are highly suitable to us Amateurs. Rolling out a 'forgotten' 1890s move in a supposedly modern opening is very satisfactory. So, what do we Internet amateurs play ? What would you think to be the most popular ? Have a guess before reading more ! What do we play in T4545 ? Top of the list, not surprisingly, is the Sicilian (B20-B99). 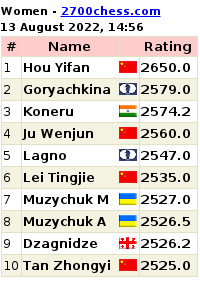 comprising 17% of the 1370 games played, with the simpler variations ( Taimonov/Kan/Closed/Alapin) outnumbering the complex ( Najdorf/Scheveningen/Dragon/Richter ) significantly. [ Note 'simpler vs complex' is a relative description - can the Sicilian be simple ?]. In third place, and a surprise to me, is the English (A10-A39) with 7%. Maybe it is played in higher divisions than U1600, as I have never experienced it. In fifth, the Queen's Gambit Declined (D30-D69), with 5.5%. After that, with more or less similar percentages (between roughly 3 and 2% ) are the Spanish ( C60-C99), King's Indian (E60-E99), general Queen Pawn Games (D00-D05) , the Pirc (B07-B09), and the Slav Defence (D10-D19). Those 10 general opening classifications form 63% of the total games played in T47. Réti, Scandinavian, Dutch, Alekhine, Trompowski/Torre Attack, Two Knights', Nimzo-Indian, Philidor, Modern/Robatsch , Petroff, Grunfeld, Scotch, Catalan, Ponziani, Italian/Bishop's Opening etc, Queen's Gambit Accepted, Bird's, Vienna Game and Benko Gambit. Bringing up the rear are the remainder, with an honourable mention, at one outing each, for the Centre Game, Old Indian and the Falkbeer Counter Gambit ( first played in 1851, by Ernst Falkbeer against Adolf Anderssen. Nice to see its still going strong ! ). 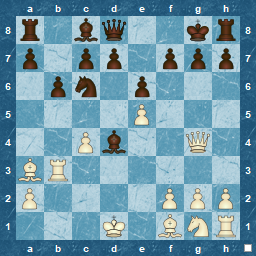 Also spare a thought for the Wing Gambit in the Sicilian ( 2.b4 ). Despite being described by Joe Gallagher as ""a forgotten relic, hardly having set foot in a tournament hall since the days of Frank Marshall and Rudolph Spielmann", with the assessment that "White sacrifices a pawn for ... well, not a lot. ", some TLers are happy to roll it out and have produced 3 out of 3 wins for White with it ! Clearly, 1.e4 is still the star of openings, but equally, the evergreen Sicilian is it's prime antagonist : White players should know a Sicilian line, or at least not complain at 1...c5 when it turns up. Black players are more likely to face 1.e4 than anything else : 56% of games start this way, with 28% pushing the d-pawn. A single game started 1.h3! ( but was decided by a miscalculation in the endgame after a see-saw game, and not the opening ). 1. d4 is played less often, and has a small disadvantage in overall percentage results ( 51 vs 53 % ) compared to e4. Black players will most likely roll out Nf6 and g6 in response, with the likelihood of a King's Indian being the result. 2.c4 is definitely the most popular second move after d4, confirming the direction that Queen Pawn players want to go. 1.c3 was also played, and gained a draw, but don't believe the statistics : the game lasted 2 moves ( 1.c3 Nf6 2. d3 ) and a 'grandmaster draw' was agreed ! If you go to more specific openings, Alapin's and the Closed Sicilian are White's main response to 1...c5 : maybe a belief among amateurs that the best way to beat the complexity of c5 is not with Nf3, d4 and the Open Sicilian ? or just trying to spoil Black's fun ? Individually, the Scandinavian is highly popular, providing 35 games ( 2,5 % ) in T47, although I have not played against it myself. Equally, the Caro-Kann, Two Knights and Pirc are quite likely, so perhaps White needs to know ideas and plans in those areas. The main White-controlled openings are the generic d4 ( D00-D05 ), the Scotch Game and Ponziani opening, and the various disguises of the Spanish. In all, various 'romantic' openings together comprise about 15% of games, mainly because of the many transpositions between them all, so identifying a main opening choice in these is difficult. I've already mentioned the one Falkbeer counter Gambit ( mainly because I remember it from my youth ) but the highly-romantic Evans Gambit also had two outings. Both wins for White: declined once, accepted once. Again make of that what you will ! Shortest game ? Apart from a one-move-agreed-draw, 8 moves to a win. Total draws ? 275, only 20% of the total : Sofia rules not required here ! Lastly, if you compare all TL tournments to T47, its interesting to note that there are more of the Caro-Kann (B13), French(C10) and Modern (B06 ) being played in the top ten openings now, with the French being the 'most increased'. Is there a recently-released French Defence book or DVD available ?! The above, naturally, is all just statistics, and amateur at that, but its interesting for me. Simply because the Sicilian is the most played opening in T47, doesn't mean it is the best choice for Black ( or even that e4 is the best for White !). Personally, when planning a TL game, I will always check the opposition, if possible, before I play. But if there aren't any to see, statistics could be useful. However, results eventually come down to who makes the last mistake, especially in Amateur chess, and, although openings have an impact on results ( and may even be critical or instrumental at times ), they aren't the last word ! Investing in good tactics, capitalising on your opponent's errors, being active, and keeping up the fight will probably bring better rewards than aiming to win in the opening : they might just improve your chess as well ! I'm just a normal Teenager ! Book of the Year - Time to vote ! Book of the Year ?